This unit introduces students to personal finance including income sources, budgeting, financial planning and the use of credit. Students will identify educational requirements to achieve the level of income desired; examine work and employability skills to ensure personal growth and development; and examine financial goals and the strategies to achieve them. This unit introduces students to various types of business ownership, distinguishing features and advantages and disadvantages of each. Students will also investigate several economic systems and discuss the advantages and disadvantages of each. Finally, students will investigate the role and impact of business on a variety of social sectors. This unit introduces students to the concept of entrepreneurship. Students identify the characteristics and skills demonstrated by entrepreneurs, research a variety of entrepreneurs, and analyse their own entrepreneurial strengths and skills. Through community involvement, students develop an understanding of how opportunities are identified and ventures created. Special emphasis is placed on inventions and innovations. This unit introduces students to current issues affecting the nation's business. The role of marketing, accounting, human resources, and management in business success is highlighted. Students investigate relevant topics such as the role of technology, ethics and responsibility, the role of management and the rights of employees. 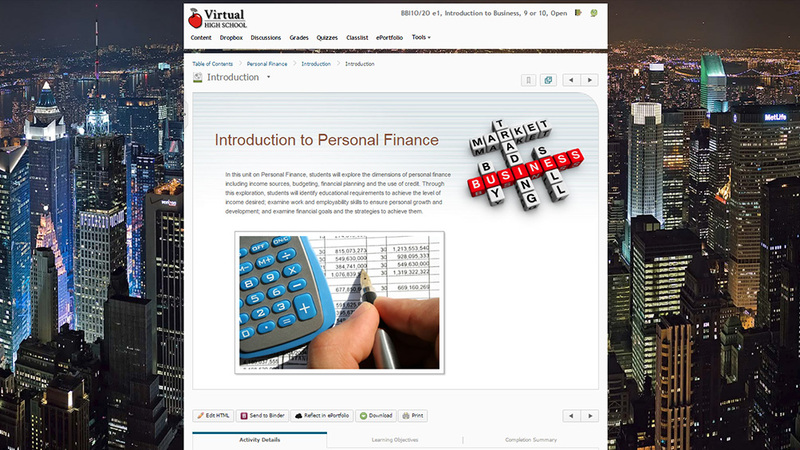 Finally, students study business plans, balance sheets and income statement for an introductory look at these important tools. This unit introduces students to the impact of trade on a nation's economy by describing its key international economic relationships and understanding how and why nations become interdependent. Students determine how businesses are affected by changes in market conditions and the environment in which business operates. Students will research Canada's trading partners and an imported product to consider trade agreements, selling prices, and tariffs. A4 demonstrate an understanding of the benefits and challenges for Canada in the field of international business. B6 demonstrate an understanding of the importance and role of information and communication technology in business. C4 analyse the role and importance of credit in personal and business finance. D2 analyse the importance of invention and innovation in entrepreneurship. Independent Learning: This course provides students with opportunities to research aspects of business independently, with direction and guiding questions provided within the course. Reflecting and Connecting: Assignments and discussions throughout the course will prompt students to reflect on concepts presented and how they connect to businesses and/or products that they encounter in their everyday lives. Self-Assessment: Through the use of interactive activities (e.g. multiple choice quizzes) students receive instantaneous feedback and are able to self-assess their understanding of concepts.